According to a LinkedIn survey from 2013, the main social media goals for small-to-medium businesses (SMBs) are to have a consistent presence online and deliver content to their target audience. Interestingly, recent statistics from Thrive Analytics show that this is where SMBs are lagging behind the most. 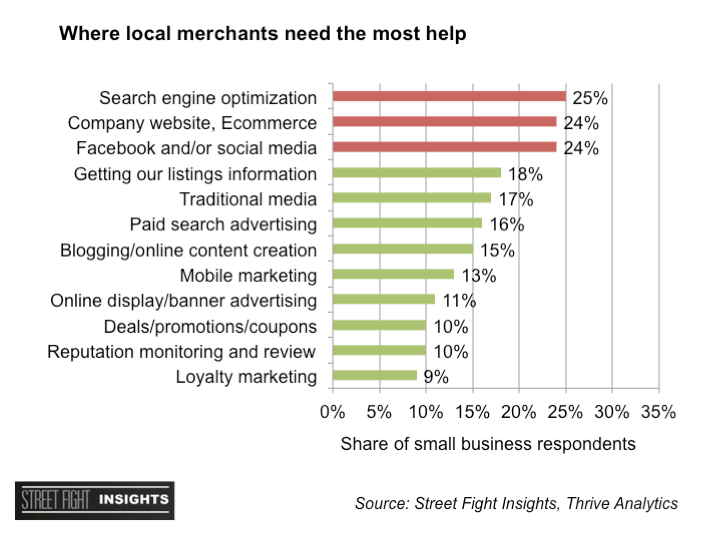 While maintaining local reputation and loyalty marketing seem to be the strong suits for most SMBs, expanding farther into the cyber arenas of SEO, websites, E-Commerce and social media leaves the most to be desired (see graphic below). Most SMBs know the importance of SEO for reaching potential customers. Simply put, if you don’t show up in the search engine, you don’t exist. But this fact doesn’t really help SMBs know how to navigate the intricate world of SEO. For one, it takes a lot of time and patience to learn exactly the best way to optimize your web copy and links. It’s even possible to over-optimize—search engines will ding you for having too many links or low quality ones. Especially in Google’s case, the algorithms for SEO are constantly changing. Many experts expect SEO to only become more complex, taking into consideration other signals such as brand, usability, load-times and social media instead of links. Despite everything that is daunting about learning SEO, the fact remains that it’s the most cost-effective marketing strategy out there. Rather than relying exclusively on paid ads, good SEO delivers free (organic) website traffic from people who are looking for services like yours. Nothing could be more worthwhile for your business marketing strategy. Once SEO has driven someone to the company site, how do you ensure that they stay and ultimately buy something? Many SMBs are having a difficult time answering this question. Key tools that promote an SMB’s personal touch; such as testimonials, FAQs, stories related to the product, and graphics are often absent from company websites. SMBs know that there’s a lot more to selling a product or service than showing the brand name and where to buy, but that knowledge doesn’t always translate to a website or E-Commerce strategy. In the past, E-Commerce has been dominated by large retailers and offered little opportunity for SMBs to engage their audience and market to potential customers. But as more than 60% of SMBs are now in “hyper growth” mode (having significant increases in growth YoY), E-Commerce is becoming much more SMB-friendly. Social Media is undoubtedly the most powerful tool you can use to market your business and engage customers. Despite the extra effort SMBs put into social media, more than 60% of businesses saw no return on their social media investment, according to a recent Manta survey. So why is there a disconnect between social media effort and sales? The simplest answer is many business owners don’t know where to start and social media has a special knack for sucking up your time. Even just the top three sites used for business marketing; Facebook, Twitter, and LinkedIn, offer so much personalization and options that you can lose hours trying to effectively engage with your audience and manage content. That’s where finding the right platform to help automate social media comes into play. There are several to choose from that help with automating posts for all major social media sites, and while those are becoming more popular, SMB’s are still not driving sales – even from their automated efforts. The next step is finding a solution to monetize on pre-existing social media audiences, along with reaching out to new potential customers. 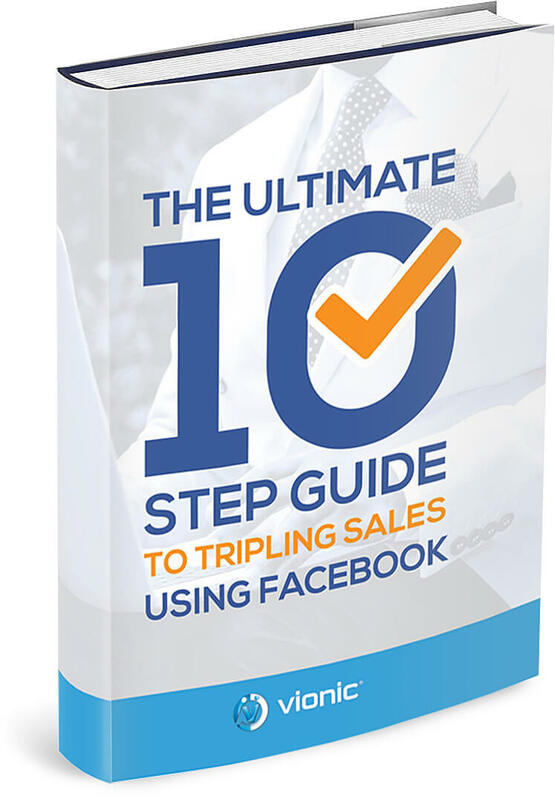 This is where SMBs often fail, however, automating a way to make sales on social media is possible and effective – Vionic offers a very SMB user friendly solution. What’s more, many SMBs don’t know about or don’t use social media analytics to see if they’re really marketing to the right audience. But like E-Commerce, social media sites are becoming increasingly more SMB-friendly (LinkedIn recently launched a website catered towards SMBs specifically), and a little know-how of the features and analytics will go a long way.